First, these letters both claim to be written by Peter the apostle (1 Pet. 1:1; 2 Pet. 1:1). In his second letter, Peter writes, “This is now, beloved, the second letter I am writing to you” (2 Pet. 3:1). The author also calls himself as a “witness of the sufferings of Christ” (1 Pet. 5:1). We should believe in the self-identification of the author, unless there are good and sufficient reasons not to. Second, 1 Peter 5:13 aligns with the record of the early church. If we take Peter’s mention of “Babylon” to refer to Rome, this would fit with Peter being in Rome during this time. Moreover, the mention of “Mark” fits with early church history as well. These “throw away comments” are undesigned coincidences that fit with Peter’s authorship. Polycarp (AD 130) cites portions of 1 Peter in his Epistle to the Philippians. Papias (AD 110) cited portions of 1 Peter according to Eusebius (Church History, 3.39.17.). Irenaeus (AD 180) cites 1 Peter 1:8 (Against Heresies, 4.9.2). Tertullian (AD 200) attributes authorship to Peter (Tertullian, Scorpiace 12). Origen (AD 250) attributes authorship to Peter according to Eusebius (Eusebius, Church History, 6.25.8). Justin Martyr makes a striking allusion to 2 Peter 2:1 in his Dialogue with Trypho (Dialogue, 82.1), Irenaeus appears to cite it (Haer. 5.23.2), and Hippolytus also seems to show knowledge of it (Hippolytus, Haer. 9.7.3; 2 Pet. 2:22). Clement of Alexandria wrote a now-lost commentary on 2 Peter, Origen cited it six times and clearly received it as canonical Scripture, and Eusebius considered it to be part of the ‘disputed’ books in the canon that were nevertheless known to most of the church… It was widely received by such figures as Jerome, Athanasius, Gregory of Nazianzus, and Augustine. Despite this evidence for Peter’s authorship, critics have challenged the authorship of the letter. For instance, Beare writes, “There can be no possible doubt that ‘Peter’ is a pseudonym.” Let’s consider several arguments advanced by the critics. ARGUMENT #1: The Greek is too polished for Peter to have written it. [1 Peter was written by a] highly educated Greek-speaking Christian who understood how to use Greek rhetorical devices and could cite the Greek Old Testament with flair and nuance. That does not apply to the uneducated, illiterate, Aramaic-speaking fisherman from rural Galilee, and it does not appear to have been produced by a secretary acting on his behalf. First, Acts 4:13 does not teach that Peter was illiterate. In Acts 4:13, we read, “As they [the Sanhedrin] observed the confidence of Peter and John and understood that they were uneducated and untrained men, they were amazed…” This passage does not teach that Peter and John were illiterate; it teaches that they were unschooled. Grudem writes, “Although agrammatos can at times mean ‘illiterate, unable to read or write’, it can also mean ‘not formally educated’, and would readily have that nuance next to idiotēs, ‘common man, layman, non-expert’ in Acts 4:13.” Remember, the religious leaders held this same view of Jesus, claiming that he was also uneducated by the standards of their day (Jn. 7:15). Grudem notes that Hellenization from Alexander the Great had progressed throughout Judea for four centuries at this point. Many of the cities around Galilee spoke and wrote in Greek, and hundreds of Jewish ossuaries (bone-boxes) have been uncovered that were written in Greek and Hebrew, showing that the people were bilingual. According to Josephus, even slaves learned Greek (Antiquities, 20.263). In addition, this is a lot to hang on one verse of the Bible. In this short exchange with the Sanhedrin, they couldn’t have known if Peter was actually illiterate because he never tries to read anything. If Peter was truly ignorant and illiterate, then why isn’t this mentioned anywhere else? This sentence gives little support to the view that Silvanus was involved in the actual writing of the letter. The Greek phrase meaning ‘to write to someone by someone else’ is nowhere else clearly seen to mean ‘to dictate a letter with the help of someone else’. Kummel notes, ‘No-one has yet proved that graphō dia tinos can mean “to authorize someone else to compose a piece of writing” ’. On the other hand, there are clear cases where this same Greek construction is used to designate the messenger who carries a letter to someone: note Acts 15:23, for example (Greek text: ‘through the hand of them [Judas and Silas]’). For this reason, this final point carries less weight. However, this still would not preclude Peter using an amanuensis, which was a common practice at the time. ARGUMENT #2: The persecutions mentioned in 1 Peter occur after Peter’s death. Peter’s refers to the “fiery trial” (1 Pet. 4:12), which was occurring “throughout the world” (1 Pet. 5:9). Critics argue that this must refer to the empire-wide persecutions of Rome, which would late-date this letter after the apostle Peter had died. This argument does not hold much weight. Worldwide persecution in the Roman Empire did not occur until the end of the second century. However, 1 Peter was quoted in the beginning and middle of the first century by the early church fathers. Blomberg writes, “No period within the first 150 years of Christian history saw empire-wide persecution of believers; this would take place only much later. Yet 1 Peter is quoted by early-and mid-second-century Christian writers, so we know if had to have been written by then.” Peter’s mention of persecution could simply be hyperbolic language about the persecution of the Roman Empire—similar to Paul’s hyperbolic language of the gospel reaching the “whole world” (Rom. 1:8). For a case that Peter was writing the letter from Rome, see comments on 1 Peter 5:13. Peter wrote these letters sometime between AD 62 and AD 68. After AD 62. Peter wrote from Rome (1 Pet. 5:13), and he wrote his second letter immediately before dying. Yet Paul never mentions Peter in his prison epistle—written from Rome. Grudem writes, “If we date Paul’s prison letters (Ephesians, Philippians, Colossians, Philemon) between AD 60 and 62, when Paul was in prison in Rome, it is interesting that he nowhere in these four letters mentions Peter.” If Peter was in Rome with Paul, it’s odd that Paul would write, “I have no one else of kindred spirit who will genuinely be concerned for your welfare. For they all seek after their own interests, not those of Christ Jesus” (Phil. 2:20-21). Apparently, Peter hadn’t made it to Rome until after these letters were written. Before AD 68. The early Christian leaders held that Peter died by persecution under the Roman Emperor Nero, who committed suicide in AD 68. Dionysius (the bishop of Corinth, AD 170) wrote, “[Peter and Paul] also taught in Italy in the same place and were martyred at the same time” (Cited in Eusebius, Church History, 2.25.8). In the context of writing about Rome, Tertullian (AD 200) wrote, “How happy is its church, on which apostles poured forth all their doctrine along with their blood! where Peter endures a passion like his Lord’s!” (Against Heretics, 36). Eusebius also recorded that Origen (AD 250) claimed that Peter was crucified upside down, and Paul was beheaded in Rome under the reign of Nero (Church History, 3.1.2-3). Eusebius adds that Peter “composed this [1 Peter] in Rome itself” (Church History, 2.15.2), and Eusebius states that he received this information from Papias (AD 110). While Peter was at first associated with Jewish evangelism (Gal. 1:18; 2:7-8), there are many reasons to believe that he led in Gentile-dominated churches later in life. Peter was initially an “apostle to the Jews” (Gal. 2:8 NLT), but he was not permanently an apostle to them. Peter made his way to Greece, which was a predominantly Gentile church (1 Cor. 1:12; 3:22; 9:5). Moreover, after Peter breaks out of jail, the book of Acts mysteriously tells us: “Then he left and went to another place…” (Acts 12:17). Peter pops up at the Jerusalem Council (Acts 15:7). However, besides this reference, we simply don’t know where Peter served. (1:18) Knowing that you were not redeemed with perishable things like silver or gold from your futile way of life inherited from your forefathers. (2:10) For you once were not a people, but now you are the people of God; you had not received mercy, but now you have received mercy. (4:3) For the time already past is sufficient for you to have carried out the desire of the Gentiles, having pursued a course of sensuality, lusts, drunkenness, carousing, drinking parties and abominable idolatries. For these reasons, we should infer that this was a Gentile-dominated church. Peter makes a reference to having difficulty reading Paul’s letters (2 Pet. 3:15-16), so we know that Peter had copies of Paul’s material. Paul wrote his letter to the Romans in the winter of AD 56-57, and Peter is in Rome immediately after this time. In 1 Peter 2, Peter seems to be interacting with Romans 9-10. In fact, he quotes the same string of OT verses that Paul does. This is such a “coincidence” that it leads us to think that Peter was reading from Paul’s work. It would be like seeing the “coincidence” of seeing two term papers with the same citations and typos in it: you would conclude that one was copying from the other. Romans 9:33 and 1 Peter 2:6 both quote Isaiah 28:16 (“Behold, I lay in Zion a stone of stumbling and a rock of offense”). Romans 10:11 and 1 Peter 2:6 both quote Isaiah 28:16 (“Whoever believes in Him will not be disappointed”). Romans 9:25 and 1 Peter 2:10 both quote Hosea 1:10 (“I will call those who were not My people, ‘My people’”). These are all signs that Peter had a copy of Romans in his hand when he wrote his book. (1:1) “Peter, an apostle of Jesus Christ, to those who reside as aliens, scattered throughout Pontus, Galatia, Cappadocia, Asia, and Bithynia.” Peter is writing to scattered Christians from Jewish and Gentile backgrounds. The term “aliens” is similar to our modern term “foreigners” or “illegal aliens.” It refers to travelers or sojourners, or a ‘man without a country.’ As Christians, our “citizenship is in heaven” (Phil. 3:21). (1:2) Are some “chosen” for heaven and others “chosen” for hell? (1:3) “Blessed be the God and Father of our Lord Jesus Christ, who according to His great mercy has caused us to be born again to a living hope through the resurrection of Jesus Christ from the dead.” The expression “born again” carries baggage in our culture. Many people think of street preachers draped in billboards that say, “REPENT! THE END IS NIGH!” when they hear this expression. Yet the term is a beautiful concept that was inaugurated by Jesus himself. In talking to a religious leader named Nicodemus, Jesus said, “You must be born again” (Jn. 3:8). Those who meet Christ are a “new creation” (2 Cor. 5:17 NIV). Just like we were born physically, we need to be born spiritually. Meeting Christ is like starting our lives all over again: a clean slate and a fresh start. No matter where you’ve been or what you’ve done, Christ can cleanse and change you. (1:4) “To obtain an inheritance which is imperishable and undefiled and will not fade away, reserved in heaven for you.” Our heavenly Father is rich beyond measure. We are his inheritors. When we die or Christ returns, we will inherit the kingdom from the King. (1:6) “In this you greatly rejoice, even though now for a little while, if necessary, you have been distressed by various trials.” During suffering, we are still able to rejoice or give thanks. We don’t give thanks for the suffering, but for our identity in Christ as outlined in the previous five verses (“In this you greatly rejoice…”). (1:7) “So that the proof of your faith, being more precious than gold which is perishable, even though tested by fire, may be found to result in praise and glory and honor at the revelation of Jesus Christ.” This expression is similar to James 1:3 (“the testing of your faith produces endurance”). This concept of God testing us like a smelter with precious metal is found throughout the Bible. The Psalmist writes, “You have tried us, O God; you have refined us as silver is refined” (Ps. 66:10). The Proverbs state, “The refining pot is for silver and the furnace for gold, but the Lord tests hearts” (Prov. 17:3). Peter returns to this metaphor in 4:12. The expression (“the proof of your faith”) is the Greek term dokimion which means “the process or means of determining the genuineness of something, testing, means of testing” or “genuineness as result of a test, genuine, without alloy” (BDAG). This is a term used for metallurgy, where gold would be smelted in a crucible. As a result, the impurities would float to the top, and the impure film would be skimmed off the top. The more times the gold was smelted, the purer it would be. When we suffer, we (rightly) think that we should do this for the glory of God. But God wants to give that glory, praise, and honor to us. (1:8) “And though you have not seen Him, you love Him, and though you do not see Him now, but believe in Him, you greatly rejoice with joy inexpressible and full of glory.” We don’t always have gushing feelings for God during times of suffering. But if you’ve never felt any emotions for God, that’s a bad sign (“you love Him… greatly rejoice with joy inexpressible”). Believing is not necessarily based in seeing (cf. Jn. 20:28; 2 Cor. 5:7). Peter is connecting our love for God with our experience of suffering. While this might be counterintuitive, he might be saying that we experience love for God in a unique way during times of suffering. (1:9) “Obtaining as the outcome of your faith the salvation of your souls.” We will be saved in the future (glorification), but we are being saved right now in the present (sanctification). (1:10-11) “As to this salvation, the prophets who prophesied of the grace that would come to you made careful searches and inquiries, 11 seeking to know what person or time the Spirit of Christ within them was indicating as He predicted the sufferings of Christ and the glories to follow.” The prophets knew many of the facts surrounding the coming Messiah, but key portions were omitted to them. Specifically, they didn’t know that the Messiah would come to suffer and die for the people (see “Why Did Satan Crucify Jesus?”). (1:12) “It was revealed to them that they were not serving themselves, but you, in these things which now have been announced to you through those who preached the gospel to you by the Holy Spirit sent from heaven—things into which angels long to look.” Even angels didn’t know that the Messiah would come to die for the people. Why does Peter bring up God’s plan in this part of the letter? He seems to be showing the fact that we are incredibly privileged to inherit this plan. Consider a family planning a wedding for their daughter. The time and resources involved in planning the wedding show the importance of the final wedding day. Similarly, God has been working his plan for eons, and now we are currently inheriting it. Peter brings this up to show how God’s people in the past were given limited knowledge of the future, and God’s work (through Christ) far exceeded what they could’ve ever imagined. Similarly, suffering believers today can’t see how God is going to use their suffering in the future, but if the past is any indicator, we will be blown away. (1:13) “Therefore, prepare your minds for action, keep sober in spirit, fix your hope completely on the grace to be brought to you at the revelation of Jesus Christ.” The term “prepare” (anazosamenoi) literally means “bind up” or “gird up.” Literally it means “of long garments to facilitate work or walking” (BDAG). Before you go out to work, you tie up your garments to work and tighten everything up for preparation. It’s important that we are prepared to suffer, having a mind that is sharpened for it. Like a football player waiting to hear, “Hut, hut, HIKE!” we brace for impact. Otherwise, we will feel blindsided when suffering strikes. Peter writes that we also need to be “sober in spirit.” Many people try to self-medicate during suffering, distract themselves, or ignore it. The Christian is to focus on the grace of God during suffering, letting it break us down and sculpt us into a stronger instrument in the Lord’s hands (Acts 9:15-16). This expression (“be sober”) is used later in the context of spiritual warfare (1 Pet. 5:8). (1:14-16) “As obedient children, do not be conformed to the former lusts which were yours in your ignorance, 15 but like the Holy One who called you, be holy yourselves also in all your behavior; 16 because it is written, ‘You shall be holy, for I am holy.’” “Holiness” (hagios) means “pertaining to being dedicated or consecrated to the service of God” (BDAG). It carries the meaning of being distinct, unique, separate, or set apart. In this context, it refers to being separate from the “former lusts” and the way of life that we knew before. How should Christians be distinct or different from our culture? The movies we watch? The music we listen to? The books we read? Not at all! We should be distinct in our love and our worldview. Some people are scared to break from conformity. It is scary to be different from the culture, but as believers, we’re supposed to be counter-cultural in the best sense. Our lives are to be filled with love for God and others. This call seems similar to Paul in Romans 12:1-2, where the change and transformation begins in the mind—not just the behavior. This concept of holiness derives from the OT, and Peter cites particularly from the book of Leviticus (Lev. 11:44; 19:2; 20:7). (1:18) “Knowing that you were not redeemed with perishable things like silver or gold from your futile way of life inherited from your forefathers.” Many people fall right into line with the faith, values, and worldview of their parents without really thinking through their faith for themselves. Peter encourages this group for choosing the harder path, choosing for the truth of Christ. (1:19) “But with precious blood, as of a lamb unblemished and spotless, the blood of Christ.” Here is true value: the blood of Christ. Someone can buy you a gift, give you money, or speak kindly to you. But Christ bled for us. Like a good father, God doesn’t just tell us that he loves us or buy us things. He demonstrated his love through the ultimate sacrifice of his son. (1:20-21) “For He was foreknown before the foundation of the world, but has appeared in these last times for the sake of you 21 who through Him are believers in God, who raised Him from the dead and gave Him glory, so that your faith and hope are in God.” There is a certain privilege to be in the Church Age. God’s plan hasn’t always had the privileges of having such a radically personal relationship with God through Christ. The resurrection is the hope of the Christian faith: just as Jesus was raised, we will be raised with him. Based on verses 4-5: How might eternal security affect our daily, practical relationship with God? If we didn’t have security in our salvation, how might this affect our relationship with God day to day? Based on verse 6: Why do you think that Peter brings up the security of our salvation in relationship to suffering? How does reflecting on the security of our salvation affect our ability to suffer victoriously? Is it wrong to conform in some areas? If not, where do we draw the line? (1:22) “Since you have in obedience to the truth purified your souls for a sincere love of the brethren, fervently love one another from the heart.” This is the thesis of the holy life mentioned earlier in verses 14-16: love for others. “Sincere” (anypokriton) means to not be hypocritical or “literally not play acting” (BDAG). Christian love isn’t supposed to be a plastic smile we tattoo onto our face. It’s an authentic commitment to others. “Fervently” (ektenos) pertains to “being persevering, eagerly, fervently, constantly” (BDAG). It’s the word used of Jesus praying fervently in the garden of Gethsemane, while he sweat drops of blood (Lk. 22:44). (1:23) “For you have been born again not of seed which is perishable but imperishable, that is, through the living and enduring word of God.” It must have been mysterious for ancient people to watch plants grow. As you plant and water the seed, it grows slowly on its own. The same is true with the word: you can’t expect to see results in a day or two. Over a few weeks or months, however, you begin to see major changes in your life. Even reading the word builds our faith (Rom. 10:17). When we sit under the word long enough, it begins to change us. It’s amazing to watch skeptics sit through several weeks or months of Bible teaching, only to discover how much it changes their attitude toward God. (1:24-25) “For, ‘All flesh is like grass, and all its glory like the flower of grass. The grass withers, and the flower falls off, 25 but the word of the Lord endures forever.’ And this is the word which was preached to you.” Peter cites Isaiah 40:6-8 to show that Scripture has an eternal impact and quality. As we read through Scripture, we are understanding the thoughts and mind of God. This means that the Bible is stable, immutable, and powerful. (2:1) “Therefore, putting aside all malice and all deceit and hypocrisy and envy and all slander.” Peter uses the same language as Paul: putting off and putting on. This isn’t self-willed change, but instead, we put off the old self by turning to the truth of Scripture. It’s as we read, study, and meditate that God works in us to effect change. We need a willingness to follow God to benefit from the word. All of these qualities are relationship killers. These can cloud our view of the word, which is mentioned in verse 2 (cf. 1 Cor. 2:14). When you approach the Bible, are you willing to hear from God? Or have you made your mind up already on your own views of the world? (2:2-3) “Like newborn babies, long for the pure milk of the word, so that by it you may grow in respect to salvation, 3 if you have tasted the kindness of the Lord.” Babies don’t make themselves grow. Instead they cry out for their mother’s milk, and it grows them radically. My son nearly tripled in size from his birth until his first birthday. The same is true of us when trying to grow spiritually. We can read the word, but not long for it. Longing implies a relationship—namely, longing to meet with our Heavenly Father. Babies eat food every couple of hours. Right from the beginning, babies know how to do this. Similarly, believers need a regular diet on God’s word. A baby might be cute when it cries in between feedings, but what if they stayed in this condition? The same is true of the believer who never learns to feed themselves with the Bible. (Read through 1:22-2:3) What do we learn about the Bible from this section? (Based on 1:23-25) Why do you think Peter compares studying the Bible to plants growing? In what ways is reading the Bible similar to growing grass? In what ways is it different? (Based on 2:2) Why do you think Peter compares studying the Bible to a baby drinking his mother’s milk? In what ways is this similar? In what ways is it different? What is our role in reading the word versus God’s role in speaking to us? (1) What is Christian community? (2:5) “You also, as living stones, are being built up as a spiritual house for a holy priesthood, to offer up spiritual sacrifices acceptable to God through Jesus Christ.” Just like Jesus is a living stone, we are also living stones. This refers to our corporate identity in Christ. In the old covenant, only the Levites (one of the tribes of Israel) could be priests. They would take people’s sacrifices to the Temple to make the people right with God. Now, Peter says that all believers in Christ are priests. We bring non-believers into the presence of God through evangelism, making them right with Him. The spiritual sacrifices refer to evangelism (cf. 2:9-10). (2:6) Why does Peter add “on him” to Isaiah 28:16? (2) How do we become a part of Christian community? (2:7) Did Peter properly cite Psalm 118:22 (c.f. Mt. 21:42)? (2:8) “And, ‘A stone of stumbling and a rock of offense’; for they stumble because they are disobedient to the word, and to this doom they were also appointed. (2:8) Does this passage teach that some people are “appointed” to hell? (2:9) Are Christians “chosen” for heaven? (3) What is our mission as a Christian community? Peter is alluding to several passages here (Ex. 19:6; Isa. 43:20-21; Hos. 2:25). The best stone in a Temple is the cornerstone. Jesus is the best of the living stones and structures the rest of us in line with him. Each rock is heavy and valuable. A temple is different than a pile of rocks. If a stone is missing from a pile of stones, no one misses it. If a stone is missing from the middle of a temple, the entire edifice will crumble! Likewise, in Christian community, we need each other to show up and use our gifts (Heb. 10:25). Each stone is hewn and placed with distinction (1 Cor. 12:18). Each stone holds up other stones (i.e. each has a role). A temple needs an Architect. God is the architect that places us together in Christian community (1 Cor. 12:18). What might happen if our church turned inward and lost its zeal for reaching lost people for Christ? George Barna wrote, “There has been ‘no growth’ in the proportion of the adult population that can be classified as [Bible-believing] Christian. The proportion of… Christians has remained constant at 32%.” Why do you think Christianity is growing in other parts of the world, but has screeched to a halt in the United States? How might our topic tonight play a role in assessing this pressing issue? Based on verse 7: People are still stumbled by the Cross of Christ today. How would you react to these statements from critics and skeptics of the Christian faith who reject the importance of the Cross of Christ? As Peter wrote this letter, one-third of the population were slaves. Emperor Nero—a homicidal maniac—sat on the throne in Rome, crucifying Christians and lighting them on fire to light up his garden parties. At one point, Nero even castrated a young boy named Sporus, and then married him publicly! Moreover, Christianity was a small, burgeoning movement surrounded by other dominant religions and worldviews that were hostile to it. It’s into this setting that Peter writes his letter on how to navigate such a fallen scenario. 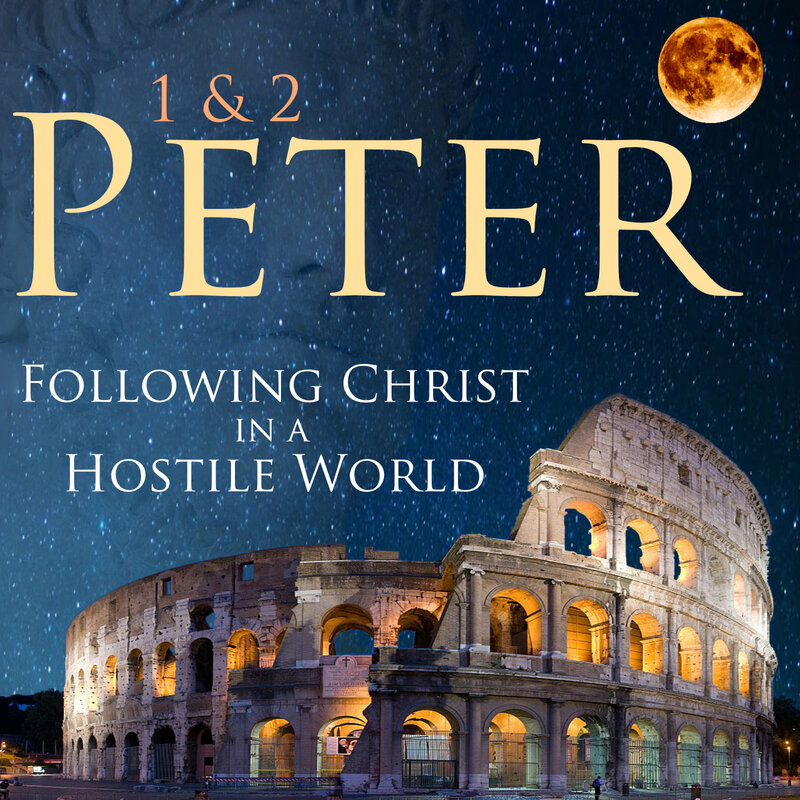 (2:11) “Beloved, I urge you as aliens and strangers to abstain from fleshly lusts which wage war against the soul.” Why does Peter refer to Christians as aliens and strangers? We are citizens of heaven (Phil. 3:20); we have transferred from this world (1 Jn. 5:19) into God’s kingdom (Col. 1:13). Since we have this new identity, we aren’t going to fit in with the world—just as Christ didn’t fit in (Jn. 15:18). Our first lesson of living in a fallen world doesn’t begin outside in the world, but inside in our heart. Before we’re ready to do battle for Christ in the public arena, we need to decide if we’re willing to genuinely and authentically desire to live for Christ in our own hearts. Do I believe that the key to my happiness is to live selfishly, or to give away my life to others? (2:12) “Keep your behavior excellent among the Gentiles, so that in the thing in which they slander you as evildoers, they may because of your good deeds, as they observe them, glorify God in the day of visitation.” In the early church, Christians were persecuted and slandered for a number of reasons (see our earlier article “Persecution of Christianity”). The result of these good deeds is that these people will “glorify God in the day of visitation.” It must have an evangelistic effect on the culture. (2:13-14) Are we supposed to submit to evil governments? (see Romans 13:1-7)? Note that we are supposed to submit “for the Lord’s sake.” It isn’t that tyranny is right or just, but submission is the best strategy to advance the cause of Christ—not drawing attention to ourselves. (2:15) “For such is the will of God that by doing right you may silence the ignorance of foolish men.” It would’ve been easy for the surrounding culture to believe that Christians were insurgents or radicals. Yet when they showed their love for the world, it had a silencing effect on their slander. (2:16) “Act as free men, and do not use your freedom as a covering for evil, but use it as bondslaves of God.” We are truly free, being strangers of this world (cf. 2:12). Yet we shouldn’t exploit our identity. We live in the world, but not of the world. (2:17) “Honor all people, love the brotherhood, fear God, honor the king.” In the first-century, the king was worshipped and adored by the people. Yet Peter simply states that we should honor the king like we would anyone else. We should reserve love for God’s people and fear for the King—our Heavenly Father (cf. Mt. 10:28). “Honor” (timaō) means “the recognition of the value of each man in his place as the creature of God.” It is used elsewhere of parents (Mt. 15:4; Eph. 6:2), false worship (Mt. 15:8), estimating a price (Mt. 27:9), accepting apostolic authority (Acts 28:10), and honoring faithful widows (1 Tim. 5:3). (2:18-20) Does the Bible support slavery? It’s easy to be patient when we suffer for our own sin, but not when it’s patience due to the sin of others. (2:21) “For you have been called for this purpose, since Christ also suffered for you, leaving you an example for you to follow in His steps.” Christ is the ultimate example of suffering under the regime of an unjust religious and political system. Jesus didn’t cry, “It’s not fair!” as the nails were being driven into his hands. Instead, he yelled, “Father, forgive them; for they do not know what they are doing” (Lk. 23:34). (2:22-25) “Who committed no sin, nor was any deceit found in His mouth; 23 and while being reviled, He did not revile in return; while suffering, He uttered no threats, but kept entrusting Himself to Him who judges righteously; 24 and He Himself bore our sins in His body on the cross, so that we might die to sin and live to righteousness; for by His wounds you were healed. 25 For you were continually straying like sheep, but now you have returned to the Shepherd and Guardian of your souls” He cites Isaiah 53:9 to support the point that Jesus was the ultimate innocent sufferer. Really, this entire section is drawing from the description of Jesus in Isaiah’s Servant Songs. Don’t be intimidated, but argue your case (1 Pet. 3:14-15). How might God use persecution to further spread the gospel? (Based on verses 18-20) What is the difference between voluntarily suffering and being a passive doormat that people can walk all over? Is Peter prescribing weaknesses here? (3:1) Was Peter a sexist pig? (3:1-2) “In the same way, you wives, be submissive to your own husbands so that even if any of them are disobedient to the word, they may be won without a word by the behavior of their wives, 2 as they observe your chaste and respectful behavior.” This is the only passage in the NT about silent evangelism (“…won without a word by the behavior…”). Here the wives of non-Christian husbands can win their husbands over to Christ through their lifestyle. (1 Pet. 3:3) Does this mean that women should not wear makeup and jewelry? (3:6) When did Sarah obey Abraham in the OT? (3:7) Does Peter think that women are inferior to men? This is an intimidating passage for husbands. We can’t move along doing ministry, while treating our wives (and kids?) like trash. In other passages, elders are not fit to lead the church, if they do not lead their households well (1 Tim. 3:4-5). (3:8-9) “To sum up, all of you be harmonious, sympathetic, brotherly, kindhearted, and humble in spirit; 9 not returning evil for evil or insult for insult, but giving a blessing instead; for you were called for the very purpose that you might inherit a blessing.” These two verses stand in contrast to each other. The first is the thesis, and the second is the antithesis. Do these qualities in verse 8 describe you, or do the qualities in verse 9 describe you? “Blessing” is eulogeo and literally means “to speak well of.” Thus prayer is probably in view (Acts 7:60; 1 Cor. 4:12). Why should we bless instead of curse others? Peter appeals to our identity in Christ (“you were called for the very purpose that you might inherit a blessing”). (3:13) “Who is there to harm you if you prove zealous for what is good?” Is this statement true? Can’t people harm walking Christians? Peter is a realist. In the next verse, he shows that the righteous do suffer. (3:14-16) “But even if you should suffer for the sake of righteousness, you are blessed. And do not fear their intimidation, and do not be troubled, 15 but sanctify Christ as Lord in your hearts, always being ready to make a defense to everyone who asks you to give an account for the hope that is in you, yet with gentleness and reverence; 16 and keep a good conscience so that in the thing in which you are slandered, those who revile your good behavior in Christ will be put to shame.” There are many reasons for the use of apologetics. In this context, Peter sees the use of apologetics for responding to bullies. While we should never attack or curse others, we should argue and reason with them, provided we are being respectful and gentle. (3:17) “For it is better, if God should will it so, that you suffer for doing what is right rather than for doing what is wrong.” If God “wills” for us to suffer, then we should be willing to stand for Christ and suffer if need be. (3:18-20) Where did Jesus go during the three days in the grave? (3:21) Can baptism save us? (4:1) Can Christians gain sinless perfection? (4:1) “Therefore, since Christ has suffered in the flesh, arm yourselves also with the same purpose, because he who has suffered in the flesh has ceased from sin.” To “arm” yourself (hoplisasthe) is a military word used for preparing for battle. For instance, Josephus uses it to refer to David getting ready to fight Goliath (Antiquities, 6:187). When you’re getting ready to go to war the next morning, you’re making up your mind in advance that you’re ready to fight—not retreat. (4:2) “So as to live the rest of the time in the flesh no longer for the lusts of men, but for the will of God.” It might seem odd that Peter places this verse here (i.e. choosing for selfish lusts), but this is usually the quickest escape plan for the Christian. When they are in the midst of suffering, it feels easy to choose for pleasure-seeking. We’re not going to self-medicate or dull our senses. We’re going to willingly choose to step into battle. (4:3) “For the time already past is sufficient for you to have carried out the desire of the Gentiles, having pursued a course of sensuality, lusts, drunkenness, carousing, drinking parties and abominable idolatries.” Peter argues that they have already gotten their fill of life apart from God. They’ve had enough of that, and know where it leads: despair, depression, broken relationships, etc. (4:4) “In all this, they are surprised that you do not run with them into the same excesses of dissipation, and they malign you.” This is a great passage for those who have left the party scene. When you meet Christ, your friends call you names, tease you, and generally scoff at your way of life. Sometimes this social pressure can feel pretty intense. Yet Peter reminds us that they’re going to have to give an account for this when Christ returns (v.5). (4:5) “But they will give account to Him who is ready to judge the living and the dead.” Instead of focusing on the judging words of our non-Christian friends, we should focus on the ultimate Judge. (4:6) Do the unsaved dead get a second chance to hear the gospel? (4:7) Did Peter think Jesus would return soon? (4:8) “Above all, keep fervent in your love for one another, because love covers a multitude of sins.” This returns to the comments in 1:22. Here he connects it with covering a multitude of sins. Why is it that when we’re engaged in selfless love that we don’t focus on people’s sins as much? As the world system becomes more potent, we need to become more loving. Do we have a center of gravity that attracts people? Is my time-investment enough to be energized or does fellowship feel like an obligation? “Hospitality” (philoxenos) is the love of strangers. “Complaint” (gongysmou) refers to an “utterance made in a low tone of voice… behind-the-scenes talk” (BDAG). Some people show hospitality, but complain about it. They invite you over to their house, but complain about the dirty dishes, stains on the rug, and trash left over. If you’re going to show hospitality, then do it out of love for others—not based on duty or obligation. (4:10) “As each one has received a special gift, employ it in serving one another as good stewards of the manifold grace of God.” We shouldn’t get a fat-head from our spiritual gift. For one, this is a gift from God. Secondly, we are just supposed to be good “stewards” of the gift. We will eventually stand before God, and explain how we used this gift for his kingdom. (4:11) “Whoever speaks, is to do so as one who is speaking the utterances of God; whoever serves is to do so as one who is serving by the strength which God supplies; so that in all things God may be glorified through Jesus Christ, to whom belongs the glory and dominion forever and ever. Amen.” It’s possible that Peter is referring to speaking the words of the Bible to each other. But surely we need to share more than simply Scripture when teaching, counseling, or building others up. We often say that “God was speaking through me.” Do we mean it? This passage states very clearly that the Holy Spirit will take over and speak through us when we are engaged in serving others (cf. 1 Thess. 2:13; 2 Cor. 5:20). When we choose to live a life of sacrificial love, we often wonder who will love us. Here God promises to supply the power as we step out in faith. (4:12) “Beloved, do not be surprised at the fiery ordeal among you, which comes upon you for your testing, as though some strange thing were happening to you.” The Greek term for “fiery ordeal” is pyrōsis (“pyro” or “pyrotechnics”). This could be literal fire (e.g. Nero’s great fire of AD 64), or it could be metaphorical. Since most of the persecution in 1 Peter refers to slander and malice, it sounds like the persecution was mostly verbal at this point. (4:13) “But to the degree that you share the sufferings of Christ, keep on rejoicing, so that also at the revelation of His glory you may rejoice with exultation.” It’s not that God has abandoned us to suffer, but we are actually sharing in his suffering. (4:14) “If you are reviled for the name of Christ, you are blessed, because the Spirit of glory and of God rests on you.” What does it mean to be “blessed” (makarios)? This is the word used by Jesus throughout the Beatitudes. We are “blessed” for washing feet or serving others (Jn. 13:17; cf. Acts 20:35). It can also be rendered “fortunate” (Acts 26:2) or even “happy” (Rom. 14:22; 1 Cor. 7:40). (4:15) “Make sure that none of you suffers as a murderer, or thief, or evildoer, or a troublesome meddler.” Some people complain about suffering that was self-inflicted (e.g. getting fired for being lazy, poor spending habits, etc.). One guy we lived with was fired multiple times for not showing up on time. He then said that God was really putting him through some testing with suffering. We couldn’t disagree more! God wasn’t testing him; rather, he was testing God! (4:17) Will Christians be judged? (4:19) “Therefore, those also who suffer according to the will of God shall entrust their souls to a faithful Creator in doing what is right.” What does it look like to entrust your soul to a faithful Creator during times of suffering? Complaining? Bitterness? Quitting? Self-medicating? …Or prayer and thanksgiving! Based on verse 7: Why does Peter connect the return of Christ with such practical aspects of the Christian life? What’s the connection between the return of Christ and being sober in spirit? Has anyone had experience in rejoicing during suffering? What was it like? (5:1) “Therefore, I exhort the elders among you, as your fellow elder and witness of the sufferings of Christ, and a partaker also of the glory that is to be revealed.” “Elders” (presbyterous) is a relative term. These leaders were only a couple of years older probably. We don’t pick elders based on their age (1 Tim. 4:12), but on their spiritual maturity. He also claimed to be an eye-witness of Christ (“witness of the sufferings of Christ”). (5:2) “Shepherd the flock of God among you, exercising oversight not under compulsion, but voluntarily, according to the will of God; and not for sordid gain, but with eagerness.” The pronoun “you” is plural—not singular (“y’all” 0r “you guys”). This speaks of plurality in leadership (cf. Acts 14:23; Titus 1:5). Leaders can go wrong so easily that we need each other to keep us accountable and on course. Jesus gave this commission to shepherd the flock to Peter just after he was found betraying Christ (Jn. 21:15ff). Our adequacy to lead doesn’t come from us. Peter saw this in Christ’s metaphor to “tend his lambs,” and it must have stuck with him. “Oversight” (episcopeo) comes from the roots epi (“over”) and scopos (“to see”). Who is “not under compulsion”? Are the elders not under compulsion to lead, or do they not lead the people under compulsion? “According to the will of God” shows us that we lead by appealing to God’s word—not our own novel opinions. It could also be by God’s power, or perhaps by God’s way. It might also refer to the fact that God has placed us in leadership. It isn’t an accident that you’re a leader. If you’re complaining, it’s really complaining against God. “Sordid gain” literally means “shameful” gain, which would refer to money, power, or getting an inflated ego from doing Christian work. (5:3) “Nor yet as lording it over those allotted to your charge, but proving to be examples to the flock.” True Christian leadership doesn’t force others to follow Christ, but we prove ourselves as examples. When people can witness true spirituality in a leader, it often has the effect of rubbing off on them (1 Tim. 4:11-16; Heb. 13:7). (5:4) “And when the Chief Shepherd appears, you will receive the unfading crown of glory.” As Christian leaders, we do not get the glory now, but we will later. Those who hog the glory for themselves have “their reward in full,” as Jesus taught (Mt. 6). Instead, true Christian leaders will receive an “unfading crown of glory.” That is, we will each be rewarded by God. (Prov 11:2) When pride comes, then comes disgrace, but with humility comes wisdom. (Prov. 16:5) The Lord detests all the proud of heart. Be sure of this: They will not go unpunished. (Prov. 16:19) Better to be lowly in spirit and among the oppressed than to share plunder with the proud. (Prov. 21:4) Haughty eyes and a proud heart, the lamp of the wicked, are sin! (5:6) “Therefore humble yourselves under the mighty hand of God, that He may exalt you at the proper time.” God will ultimately exalt us at the return of Christ. (5:7) “Casting all your anxiety on Him, because He cares for you.” Leading for God also has its anxieties (cf. 2 Cor. 11:28). It’s no wonder, then, that Peter has instructions on how to handle anxiety in this section. Peter counsels, “Cast all your anxiety (merimnaō) on God because he cares (melei) for you” (1 Pet. 5:7). Did you notice the play on words in the Greek? The same root word is used for our “anxiety” and God’s “care” for the anxious. Literally, this passage reads: “Give your anxiety to God, because he is anxious for you.” It’s God’s job to worry about our needs and problems—not ours. Our job is to trust that he is worrying about us. Why does he use the lion imagery? It seems that lions stalk their prey from afar, but then they strike without mercy. Could the same be true of Satan? (5:9) “But resist him, firm in your faith, knowing that the same experiences of suffering are being accomplished by your brethren who are in the world.” Often when we go under spiritual attack, we feel isolated and lonely, like no one can understand how we’re feeling. As we open up to other believers, it’s refreshing to simply hear others share similar struggles and the pain that comes from spiritual warfare. (5:10) “After you have suffered for a little while, the God of all grace, who called you to His eternal glory in Christ, will Himself perfect, confirm, strengthen and establish you.” God will restore us and strengthen us after we encounter suffering—not before. If we opt out of suffering before God does his intended work, we are effectively pulling the plug on the Holy Spirit’s ability to transform us. (5:13) Was Peter really in Babylon? (5:14) Should we greet each other with a holy kiss? In this first chapter, Peter opens with the fact that God wants to transform us. People often get worried about this, wondering what God will do in our lives. In what way will God change my life? Angela from The Office? Flanders from The Simpsons? Not at all. Instead, God will transform us to becoming a more loving, Christ-like person. The picture Peter paints for spiritual growth is a beautiful vision for each and every one of us. (1:1) “Simon Peter, a bond-servant and apostle of Jesus Christ…” Jesus transformed Peter from being an arrogant, self-absorbed, denier of Christ. But God turned him into a very stable and strong leader. As Peter discusses the subject, he stands as a trophy of God’s grace, and writes with real authority. “…to those who have received a faith of the same kind as ours…” We all have the same faith as believers. The object of our faith is Christ’s work. (1:1) Does this passage support the deity of Christ? (1:2-3) “Grace and peace be multiplied to you in the knowledge of God and of Jesus our Lord; 3 seeing that His divine power has granted to us everything pertaining to life and godliness, through the true knowledge of Him who called us by His own glory and excellence.” When it comes to doing God’s will, he offers all of the power that we need. He does this according to the “true knowledge” (cf. 2 Tim. 3:16-17). While God’s word doesn’t answer every problem that we have (e.g. filling a tooth, unclogging a toilet, etc. ), it gives us everything that we need to live a godly life. Note that this power and identity is a past tense event (“[God] has granted to us everything”). This means that we need to cash in on the power and identity that has already been given to us. (1:4) “For by these He has granted to us His precious and magnificent promises, so that by them you may become partakers of the divine nature, having escaped the corruption that is in the world by lust.” What does it mean to be a partaker of the divine nature? The term for “partaker” is koinonia, which means “to share.” The term “nature” (physeos) means “condition or circumstance as determined by birth, natural endowment/condition, nature” or “the natural character of an entity, natural characteristic/disposition” (BDAG). This would mean that we share in God’s character—not his divinity—as the further context makes clear. This is in contrast to the world-system (kosmos). (1:5-7) “Now for this very reason also, applying all diligence, in your faith supply moral excellence, and in your moral excellence, knowledge, 6 and in your knowledge, self-control, and in your self-control, perseverance, and in your perseverance, godliness, 7 and in your godliness, brotherly kindness, and in your brotherly kindness, love.” Peter lists many different character qualities. It doesn’t seem that these qualities lead to the other qualities in a linear way. Instead, these seem like a constellation of qualities. If we’re missing one of them, it compromises the entire picture. When we study these character qualities, these are nothing new to us (hopefully!). Yet these slowly slip away. We need to be “stirred up by way of reminder” (1:13). “Diligence” (spoudē) normally translated as “haste, hurry, or earnestness.” This is the opposite of apathy and indifference. Read Spurgeon’s chapter on “Earnestness” from Encounter with Spurgeon. “Moral excellence” (aretē) is usually given in the context of God’s own character. Moral goodness matters to God and to spiritual growth. “Knowledge” is integral to the Christian life. Some fundamentalist Christians are suspicious of knowledge. They might say, “I don’t want to get into a real heavy knowledge trip…” But what is the alternative? An ignorance-trip? A stupidity-trip? Knowledge in itself doesn’t change us, but knowledge is necessary to change. God works through the transformation of our minds (Rom. 12:1-2). “Godliness” refers to reverence and a consciousness of God. “Brotherly kindness” is the opposite of coldness, learning to feel for others. “Love” (agape) takes love to a new level. Paul puts love at the top of his list as well (Gal. 5:22; 1 Cor. 13). Having our character change is a gradual process—not typically transformed overnight. If God sovereignly chooses to change a certain area of our lives, this is his prerogative. Yet he doesn’t promise this. (1:8) “For if these qualities are yours and are increasing, they render you neither useless nor unfruitful in the true knowledge of our Lord Jesus Christ.” Knowledge and spiritual growth are closely tied. Usually, we think of knowledge coming first, but in this case, the qualities come first. It must be that when we have the right attitude toward God that we gain in our knowledge of Christ. (1:9) “For he who lacks these qualities is blind or short-sighted, having forgotten his purification from his former sins.” Our transformation is tied to remembering and trusting in our identity in Christ. It’s only as we remember our identity that transformation occurs (Jas. 1:22-25). (1:10) “Therefore, brethren, be all the more diligent to make certain about His calling and choosing you; for as long as you practice these things, you will never stumble.” We need to be grounded in our calling and choosing, which is a part of our identity. (1:11) “For in this way the entrance into the eternal kingdom of our Lord and Savior Jesus Christ will be abundantly supplied to you.” We will be richly rewarded for our faithfulness to spiritual growth and influence on others. (1:12-13) “Therefore, I will always be ready to remind you of these things, even though you already know them, and have been established in the truth which is present with you. 13 I consider it right, as long as I am in this earthly dwelling, to stir you up by way of reminder.” We don’t usually need novel insights into spiritual growth. We need to become “glorified reminders” to one another. What do you think is our role in spiritual growth versus God’s role? When can we tell if we’re taking on too much in our role? When can we tell if we’re not playing our role well enough? (1:14) “Knowing that the laying aside of my earthly dwelling is imminent, as also our Lord Jesus Christ has made clear to me.” Peter realizes that he will die soon. Most commentators relate this insight to John 21:18-19, where Jesus predicted Peter’s death. This doesn’t seem correct. Jesus predicted how Peter would die, but now Peter writes that he knows when he will die (“is imminent”). How did Peter get insight into this? How did Jesus “make this clear” to Peter? A vision? An intuition of his circumstances? (1:15) “And I will also be diligent that at any time after my departure you will be able to call these things to mind.” It’s interesting what people tell us from their deathbed. They are often in their most honest moments, and they want to pass on what they’ve learned in their lives. What is Peter thinking about in his final moments on Earth? (1:16-18) “For we did not follow cleverly devised tales when we made known to you the power and coming of our Lord Jesus Christ, but we were eyewitnesses of His majesty. 17 For when He received honor and glory from God the Father, such an utterance as this was made to Him by the Majestic Glory, ‘This is My beloved Son with whom I am well-pleased’— 18 and we ourselves heard this utterance made from heaven when we were with Him on the holy mountain.” Peter starts thinking back to his experience on the Mount of Transfiguration (Mt. 17; Mk. 9; Lk. 9). He emphasizes the truth of Christ (“we did not follow cleverly devised tales” Greek muthos or “myths”). Are we supposed to ground our faith in experiences like this? The “morning star” (phōsphoros) appears only here in the NT, but the use of “star” for the Messiah occurs in Numbers 24:17 (“a star … out of Jacob”). Related expressions—”the rising sun” (Luke 1:78) and “the bright Morning Star [astēr]” (Rev 22:16)—support the view that Peter is referring to Christ. (1:20-21) “But know this first of all, that no prophecy of Scripture is a matter of one’s own interpretation, 21 for no prophecy was ever made by an act of human will, but men moved by the Holy Spirit spoke from God.” Peter is not stating that people need someone to interpret the Bible for them (“…no prophecy of Scripture is a matter of one’s own interpretation…”). First, the context refers to the prophets writing Scripture—not believers reading Scripture. The connecting word “for…” makes this connection. Second, the term “interpretation” can also be rendered “imagination” (NET) or “understanding” (NLT). Peter is claiming that prophets were moved along by God’s inspiration to write exactly what he wanted. Based on verse 19: In what way is the Bible more certain than our subjective spiritual experiences? Why would Peter place the Bible over his experience on the Mount of Transfiguration? Humbling: given in preparation to serious suffering (Acts 18; 2 Cor. 12:7). If you’re going to get the trip to the third heaven, you need to take the thorn in flesh with it. False teaching is an oft-repeated theme of the NT, mentioned in 17 of the 22 NT letters if we include the letters in Revelation 2-3 (e.g. Rom. 16:17,18; 1 Cor. 15:12; 2 Cor. 2:17; 11:13-15; Gal. 1:6-9; 5:10-12; Phil. 3:2; Col. 2:16-23; 2 Thess. 2:1,2; 1 Tim. 1:3ff. ; 4:1-5; 6:3-5; 2 Tim. 3:1-8; Titus 1:10-16; 3:9-11; Heb. 13:9; 2 Pet. 2:1-22; 1 Jn. 2:18-26; 4:1-6; 2 Jn. 1:7-9; 3 Jn. 1:9,10; Jude 1:4ff. ; Rev. 2:2,15,20). Jesus reserved his harshest words for false teachers, unleashing a verbal flamethrower on the Pharisees (Mt. 23). (2:1) “But false prophets also arose among the people, just as there will also be false teachers among you, who will secretly introduce destructive heresies, even denying the Master who bought them, bringing swift destruction upon themselves.” False teachers do not appear through a portal from another dimension. They come from “among the people” and “among you.” They arise from inside the Body of Christ (c.f. Acts 20:29-30; Gal. 2:4). They are highly covert—not overt. No false teacher ever tells you that they are going to ruin your spiritual life; instead, they “secretly introduce destructive heresies” (c.f. 2 Cor. 11:14; Gal. 2:4). They deny the person of Christ (“denying the Master who bought them,” c.f. 1 Cor. 15:3ff; Gal. 1:6-9). They also deny the work of Christ. At the end of the book, Peter writes, “You therefore, beloved, knowing this beforehand, be on your guard so that you are not carried away by the error of unprincipled men and fall from your own steadfastness, 18 but grow in the grace and knowledge of our Lord and Savior Jesus Christ” (2 Pet. 3:17-18). (2:1) Do false teachers lose their salvation? (2:2) “Many will follow their sensuality, and because of them the way of the truth will be maligned.” Denying the truth leads to sexual immorality (c.f. Rom. 1:21-32). This term (aselgeia) refers those who are given over to blatant sexual immorality and other corrupt behavior. In verses 15-16, Peter appeals to Balaam, who was a classic “prophet for hire.” The enemies of Israel wanted Balaam to curse Israel, and he got paid for it. He never brought a curse against Israel, but a blessing instead. Yet Balaam was far from a good man. He took money and taught immorality (Num. 31:16). In fact, the donkey had more spiritual insight than the prophet! True Christian teachers guard themselves against accusations regarding money (2 Cor. 8:19-21). “False words” (plastos) is the root from which we get the word “plastic.” False teachers add or subtract from Scripture (c.f. Rev. 22:18-19). (2:4) “For if God did not spare angels when they sinned, but cast them into hell and committed them to pits of darkness, reserved for judgment.” The Greek word for hell here is tartaroō, which only occurs here in the NT. Blum records, “Tartarus, thought of by the Greeks as a subterranean place lower than Hades where divine punishment was meted out, was so regarded in Jewish apocalyptic as well.” In Greek mythology, this was the place that the gods would be judged. Of course, Peter isn’t using this term to affirm Pagan mythology. Instead, he is contextually using their term to make his point. This was an appropriate term to describe a place where angels will be judged in hell. (2:5-11) “And did not spare the ancient world, but preserved Noah, a preacher of righteousness, with seven others, when He brought a flood upon the world of the ungodly; 6 and if He condemned the cities of Sodom and Gomorrah to destruction by reducing them to ashes, having made them an example to those who would live ungodly lives thereafter; 7 and if He rescued righteous Lot, oppressed by the sensual conduct of unprincipled men 8 (for by what he saw and heard that righteous man, while living among them, felt his righteous soul tormented day after day by their lawless deeds), 9 then the Lord knows how to rescue the godly from temptation, and to keep the unrighteous under punishment for the day of judgment, 10 and especially those who indulge the flesh in its corrupt desires and despise authority. Daring, self-willed, they do not tremble when they revile angelic majesties, 11 whereas angels who are greater in might and power do not bring a reviling judgment against them before the Lord.” Peter cites a number of examples of God’s judgment in the OT. In this way, he is showing that God’s solution for false teachers is judgment. (2:12) “But these, like unreasoning animals, born as creatures of instinct to be captured and killed, reviling where they have no knowledge, will in the destruction of those creatures also be destroyed.” If we strip the spiritual component to humans, what is left? We are just relatively advanced primates (“…like unreasoning animals…”). (2:13) “Suffering wrong as the wages of doing wrong. They count it a pleasure to revel in the daytime. They are stains and blemishes, reveling in their deceptions, as they carouse with you.” This refers to God’s passive wrath until the day of judgment. Solomon writes, “They would not accept my counsel, they spurned all my reproof. 31 So they shall eat of the fruit of their own way, and be satiated with their own devices” (Prov. 1:30-31). (2:14) “Having eyes full of adultery that never cease from sin, enticing unstable souls, having a heart trained in greed, accursed children.” The term “trained” is the word that usually relates to athletic training (“gymnasium”). Peter is saying that these false teachers have created such serious sin habits that it’s almost as if they have been through “training” in sin! (2:19) “Promising them freedom while they themselves are slaves of corruption; for by what a man is overcome, by this he is enslaved.” There is a certain irony of promising freedom when they are themselves really enslaved (cf. Jn. 8:34). We’re now free to sin, but we’re no longer free to stopping sinning. Sin leads to terrible addictions. (2:20) “For if, after they have escaped the defilements of the world by the knowledge of the Lord and Savior Jesus Christ, they are again entangled in them and are overcome, the last state has become worse for them than the first.” What makes them worse off? Is it more agonizing? Do they have a hardened of heart? Are they more responsible? All of the above? (2:21) “For it would be better for them not to have known the way of righteousness, than having known it, to turn away from the holy commandment handed on to them.” This implies that judgment is the key issue. (2:22) “It has happened to them according to the true proverb, ‘A dog returns to its own vomit,’ and, ‘A sow, after washing, returns to wallowing in the mire.’” They had no inner heart change (Prov. 26:11). Peter compares their behavior to dogs and pigs, which were unclean in this culture. Discern counterfeits through doctrine (2 Cor. 11:4; Gal. 1:6-9). Discern counterfeits through deeds (Titus 1:16; 3 Jn. 1:10; 2 Cor. 11:15; Mt. 7:15-20; 11:19; 23:3; 1 Jn. 2:6; 2 Pet. 2:18-19; Jn. 10:12-13). Don’t allow them to make you cynical of the truth! (3:2) “That you should remember the words spoken beforehand by the holy prophets and the commandment of the Lord and Savior spoken by your apostles.” Peter places the OT on par with the growing NT canon. (3:4) “And saying, ‘Where is the promise of His coming? For ever since the fathers fell asleep, all continues just as it was from the beginning of creation.’” People will argue that everything has stayed the same over the millennia. Yet when we look at history and current trends, we see that trends are heading to a drastic conclusion (see our book, Endless Hope or Hopeless End: The Bible and the End of Human History ). (3:5-6) “For when they maintain this, it escapes their notice that by the word of God the heavens existed long ago and the earth was formed out of water and by water, 6 through which the world at that time was destroyed, being flooded with water.” Peter’s point seems to be that God has brought judgment before, and he will do it again. (3:5) Did Peter believe that God created the universe from water or from nothing as Genesis teaches? (3:7) “But by His word the present heavens and earth are being reserved for fire, kept for the day of judgment and destruction of ungodly men.” Does this mean that God will annihilate the universe? Or judge, burn, and restore it? (3:8) “But do not let this one fact escape your notice, beloved, that with the Lord one day is like a thousand years, and a thousand years like one day.” While a lot of time has transpired, God’s timeframe is different than ours. (3:9) “The Lord is not slow about His promise, as some count slowness, but is patient toward you, not wishing for any to perish but for all to come to repentance.” God wants to wait the maximum amount of time so that the maximum number of people can meet Christ. If Jesus returned 100 years ago, it would’ve ended war and violence, but it also would’ve meant that millions of people would not have met Christ yet. (3:9) Does this passage invalidate limited atonement? In view of God’s judgment, how should this connect to our practical living? (3:11-12) Can we speed up Christ’s coming? (3:15-16) “And regard the patience of our Lord as salvation; just as also our beloved brother Paul, according to the wisdom given him, wrote to you, 16 as also in all his letters, speaking in them of these things, in which are some things hard to understand, which the untaught and unstable distort, as they do also the rest of the Scriptures, to their own destruction.” Even Peter had a difficult time interpreting Paul’s words! While the Bible is perspicuous (or easily understood) in regards to its main message, it isn’t always clear in regards to its details. Blomberg, Craig. From Pentecost to Patmos: an Introduction to Acts through Revelation. Nashville, TN: B & H Academic, 2006. 441. Emphasis mine. Clowney, E. P. The message of 1 Peter: The way of the cross. The Bible Speaks Today. Leicester, England; Downers Grove, IL: InterVarsity Press. 1988. 19. Grudem, W. A. (1988). 1 Peter: an introduction and commentary (Vol. 17, pp. 22–23). Downers Grove, IL: InterVarsity Press. Grudem, W. A. (1988). 1 Peter: an introduction and commentary (Vol. 17, p. 23). Downers Grove, IL: InterVarsity Press. Kruger, Michael. Canon Revisited: Establishing the Origins and Authority of the New Testament Books. Wheaton, IL. Crossway. 2012. 271. F. W. Beare, The First Epistle of Peter (Oxford: Blackwell, 1970). 29. Cited in Grudem, W. A. (1988). 1 Peter: an introduction and commentary (Vol. 17). Downers Grove, IL: InterVarsity Press. Ehrman, Bart D. Forged: Writing in the Name of God: Why the Bible’s Authors Are Not Who We Think They Are. New York: HarperOne, 2011. 138-139. Grudem, W. A. (1988). 1 Peter: an introduction and commentary (Vol. 17, pp. 26–27). Downers Grove, IL: InterVarsity Press. Grudem, W. A. (1988). 1 Peter: an introduction and commentary (Vol. 17, p. 28). Downers Grove, IL: InterVarsity Press. Carson, D. A. (1991). The Gospel according to John (p. 74). Leicester, England; Grand Rapids, MI: Inter-Varsity Press; W.B. Eerdmans. Carson, D. A., and Douglas J. Moo. An Introduction to the New Testament. Second ed. Grand Rapids, MI: Zondervan, 2005. 645. Grudem, W. A. (1988). 1 Peter: an introduction and commentary (Vol. 17, p. 24). Downers Grove, IL: InterVarsity Press. Blomberg, Craig. From Pentecost to Patmos: an Introduction to Acts through Revelation. Nashville, TN: B & H Academic, 2006. 442. Grudem, W. A. (1988). 1 Peter: an introduction and commentary (Vol. 17, p. 37). Downers Grove, IL: InterVarsity Press. Jobes, K. H. (2005). 1 Peter (p. 87). Grand Rapids, MI: Baker Academic. Blum, E. A. (1981). 1 Peter. In F. E. Gaebelein (Ed. ), The Expositor’s Bible Commentary: Hebrews through Revelation (Vol. 12, p. 221). Grand Rapids, MI: Zondervan Publishing House. Grudem, W. A. (1988). 1 Peter: an introduction and commentary (Vol. 17, p. 69). Downers Grove, IL: InterVarsity Press. Marshall, I. H. (1991). 1 Peter (1 Pe 1:6). Downers Grove, IL: InterVarsity Press. Grudem, W. A. (1988). 1 Peter: an introduction and commentary (Vol. 17, p. 104). Downers Grove, IL: InterVarsity Press. Hillyer, Norman “Rock Stone Imagery in 1 Peter.” Tyndale Bulletin 22 (1971) 66. Beale, G. K., & Carson, D. A. (2007). Commentary on the New Testament use of the Old Testament (p. 1032). Grand Rapids, MI; Nottingham, UK: Baker Academic; Apollos. Barna, George. Marketing the Church. Navpress, Colorado Springs, CO, 1990. Hopkins, Julie M. Towards a Feminist Christology: Jesus of Nazareth, European Women, and the Christological Crisis. Grand Rapids, MI: William B. Eerdmans Pub., 1995. 51. Hitchens, Christopher. God Is Not Great: How Religion Poisons Everything. New York: Twelve, 2007. 209. Cited in Neill, Stephen. A History of Christian Missions. 2nd ed. Harmondsworth, Middlesex, England: Penguin, 1986. 37-38. Blum, E. A. 1 Peter. In F. E. Gaebelein (Ed. ), The Expositor’s Bible Commentary, Volume 12: Hebrews Through Revelation (F. E. Gaebelein, Ed.). Grand Rapids, MI: Zondervan Publishing House. 1981. 234. Beale, G. K., & Carson, D. A. (2007). Commentary on the New Testament use of the Old Testament (1037). Grand Rapids, MI; Nottingham, UK: Baker Academic; Apollos. John R. W. Stott, The Contemporary Christian (Downers Grove: InterVarsity Press, 1992), p. 51. Blum, E. A. (1981). 1 Peter. In F. E. Gaebelein (Ed. ), The Expositor’s Bible Commentary, Volume 12: Hebrews Through Revelation (F. E. Gaebelein, Ed.) (246). Grand Rapids, MI: Zondervan Publishing House. Nee, Watchman. The Normal Christian Life. Ft. Washington, PA: Christian Literature Crusade, 1961. 90-95. BAG, p. 813. Cited in Blum, E. A. (1981). 2 Peter. In F. E. Gaebelein (Ed. ), The Expositor’s Bible Commentary, Volume 12: Hebrews through Revelation (F. E. Gaebelein, Ed.) (278). Grand Rapids, MI: Zondervan Publishing House. Blum, E. A. (1981). 2 Peter. In F. E. Gaebelein (Ed. ), The Expositor’s Bible Commentary, Volume 12: Hebrews through Revelation (F. E. Gaebelein, Ed.) (280-281). Grand Rapids, MI: Zondervan Publishing House. Blum, E. A. (1981). 2 Peter. In F. E. Gaebelein (Ed. ), The Expositor’s Bible Commentary: Hebrews through Revelation (Vol. 12, p. 287). Grand Rapids, MI: Zondervan Publishing House.